For decades, engineers have been excited about a theoretical battery technology called lithium-air, which has an energy density comparable to that of gasoline. So excited, in fact, that it's been dubbed an 'ultimate' battery. Now, that battery is a reality. Chemists at the University of Cambridge have built a working prototype of a lithium-air battery - and early tests show its impressive properties. As well as the extreme energy density, it's also more than 90% efficient and - to date - can be recharged more than 2000 times. "What we've achieved is a significant advance for this technology and suggests whole new areas for research," said Clare Grey, senior author on a paper describing the discovery. We haven't solved all the problems inherent to this chemistry, but our results do show routes forward towards a practical device." 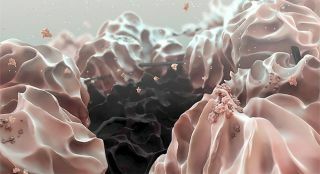 The advance was made possible with several breakthroughs, including a highly porous 'fluffy' carbon electrode made of graphene and a number of additives that change the chemical reactions going on inside the battery to improve its stability and safety. But the researchers say a practical version of the battery is still at least a decade away. "There's still a lot of work to do," said Tao Liu, the paper's first author. "But what we've seen here suggests that there are ways to solve these problems – maybe we've just got to look at things a little differently."